There is a lot riding on your tyres. We firmly believe that once tyres have been fitted; they need to be looked after properly to maximise safety and performance. If you look after your tyres- they can also look after your safety and your pocket. 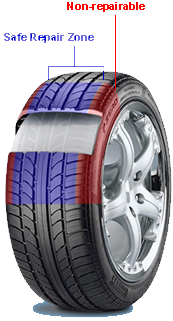 Tyres are the only parts of the car which are in contact with the road. Your safety in acceleration, braking, steering and cornering, all depend on them. Here a few of our top tips for maximising your tyres performance. The correct tyre inflation pressure for your car can be found in the car manufacturer's handbook. Most tyre manufactures also supply correct pressure and fitment details for their tyres. Tyre pressures relate to loads, speeds and vehicle handling and the right tyre pressure is vital for even braking, maximum grip and reducing the wear and tear on your tyre. 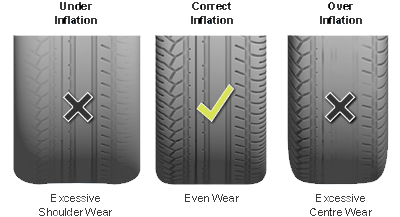 Inflation pressure should be checked at least once a fortnight when the tyre is cold, since there is an increase in pressure when the tyre has warmed up. A reliable pressure gauge should always be used. The correct tracking or alignment of your wheels is important as it greatly increases the life of you tyres by avoiding excessive wear on one side of the tread. The right tracking or alignment also improves the handling of your vehicle and you will deliver a more comfortable performance. Tyres can deteriorate with age which shows as cracking on the tread and sidewall rubber. Cracking is usually an indication that tyres have been in use an extremely long time. If cracking is severe the tyre must be replaced. Tyres fitted to caravans and boat trailers which are parked for long periods of time, particularly in coastal regions, will tend to age and crack more quickly than those which are used and run frequently. If you are unsure if your tyres need to be replaced- why not make an appointment at any Just Tyres fitting centre. It is sometimes possible to have your tyres repaired, they don’t always have to be replaced. Repairs to tyres and tubes must be carried out to meet the British Standard AU 159 and should always be entrusted to a specialist. Essentially, this means plugging a hole, not patching over it. All punctured or damaged tyres should be removed from the wheel for internal and external examination to ensure that there is no hidden damage that could cause a later failure. Just Tyres recommends that neither externally applied patch repairs or liquid sealants are used to repair a damaged tyre. Just Tyres does not accept responsibility for problems resulting from these types of repair. For safety reasons, Just Tyres does not recommend more than two tread repairs on tyres with a lower speed rating and only one tread repair for higher speed rated tyres. Repairs should only ever be carried out in the safety zone shown below. Safety is paramount- if you are unsure and you would like more advice, please speak to one of our tyre experts on 0333 22 05071 or book an appointment at one of our fitting centres for them to assist you. To ensure even wear and tear on your tyres and tyres should always be re-balanced after a puncture repair. You should never use a tyre on a damaged, distorted or modified wheel since this could mean the tyre becomes damaged and deflated and could result in the loss of control of the vehicle. Many modern cars and 4x4 vehicles can be fitted with alternative tyres and wheels than those fitted as original equipment by the car manufacturer. If you would like more information about the possibilities for your vehicle, please ask your Just Tyres specialist. Inner-tubes of the correct size can be used with tubeless tyres if they are correctly fitted. Please remember that by fitting tubes in tubeless tyres, in the event of a puncture, the assembly will behave exactly like a tubed tyre – it is likely to lose pressure more rapidly than a tubeless tyre assembly. Where tubes for certain low profile tubeless tyres are not available, an alternative size tube should NOT be fitted. Tyres that are marked 'Tube Type' or are not marked 'Tubeless' must be fitted with an inner tube. Some vehicle manufactures recommend that only tube type tyres are fitted to their vehicles. It is important that the advice in the owner's handbook be followed. A new tube should be fitted whenever the tyre is replaced. When purchasing your tyre- there are certain tyres that are not designed for extreme loads. It is important you purchase a suitable tyre. Please remember that the performance and longevity of your tyres is also dependent on your individual driving style.